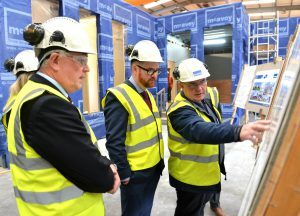 Headquartered in Dungannon, the McAvoy Group which delivers fast-track design and build projects comprising permanent buildings, extensions to existing buildings and hire modules has plans to grow its turnover to £100million by 2020. 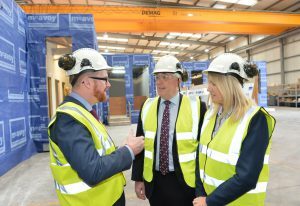 The multi-million pound investment over the next 4 years will enable the company to grow its Permanent Modular Construction Division, replenish its Hire Division stock, invest in new IT infrastructure as well as creating 38 new roles. Invest Northern Ireland has offered an Employment Grant of £198,000 to support the creation of 18 of the jobs and £135,000 under it Skills Growth Programme towards the company’s training activities. Welcoming the investment including the new jobs Minister Hamilton said: “The McAvoy Group has been a leading player within the offsite modular construction sector in Great Britain and the Republic of Ireland for a number of years. “The company is driving forward a robust growth strategy targeting new clients and procurement frameworks in the healthcare, education, residential and commercial markets. This multi-million pound investment will help the company to achieve its ambitious growth targets as well as contributing additional salaries to the local economy. The McAvoy Group currently employs 170 people and has offices in the UK and Ireland. 24 of the 38 roles are in place with the roles being in both the company’s Dungannon and Lisburn offices. Eugene Lynch, Managing Director of the McAvoy Group, said: “This investment is focused on growing our permanent modular construction division and consolidating the company as a key player in the UK market. The new roles are in design, contract and cost management positions and we plan to recruit a further 14 jobs as well as graduates and apprentices roles over the next 12 months. Over the past 44 years McAvoy has delivered more than 3million m2 of modular accommodation for the education, health, commercial, infrastructure and hospitality sectors. The company recently handed over an £18million project for Goresbrook School in Dagenham, London and is currently working on a £20million project Lynch Hill School in Slough – one of the UK’s largest ever offsite modular constructed Secondary Schools.